I prepped this figure for painting back in late 2013 and have been looking at its half finished form ever since. It is a relief to finally have it painted and to therefore have all four Dark Judges finally ready for the tabletop. 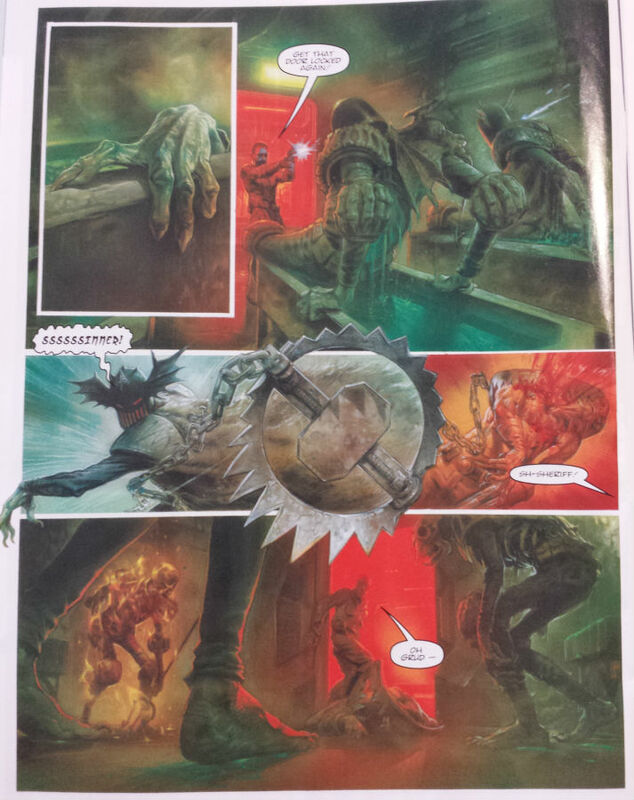 Of all of the Dark Judges, Fear sports perhaps the most preposterous outfit, which in the context of the Dark Judges is really saying something. EDIT: Goofy as he may be, Fear can be creepy too, in a Hammer Horror fashion. Fear has the ability to throw big man-traps that immobilise and/or injure targets. 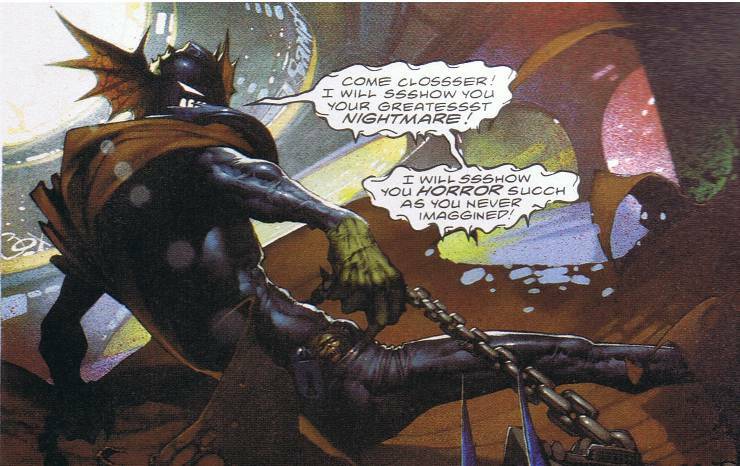 Im not sure where the traps come from, but they tie in thematically with his costume at least. Fears never-ending Mantrap hurling ability is in addition to his standard suite of Dark Judge powers (immortality, fatal touch, extreme zombie-like resistance to physical attacks, trans-dimensional transport technology via the transdimensional globe on his belt, telepathic link with other Dark Judges, the ability while in gaseous form to telepathically control susceptible psychics). Fear also has a second and signature form of dispensing “Justiccce!”, his gaze causes psychological damage and death in victims. Fear usually controls the effect by opening the gate/portcullis like faceplate on his hilarious looking helmet. Barring one or two exceptions, Fears spooky visage has not been shown in the strip. 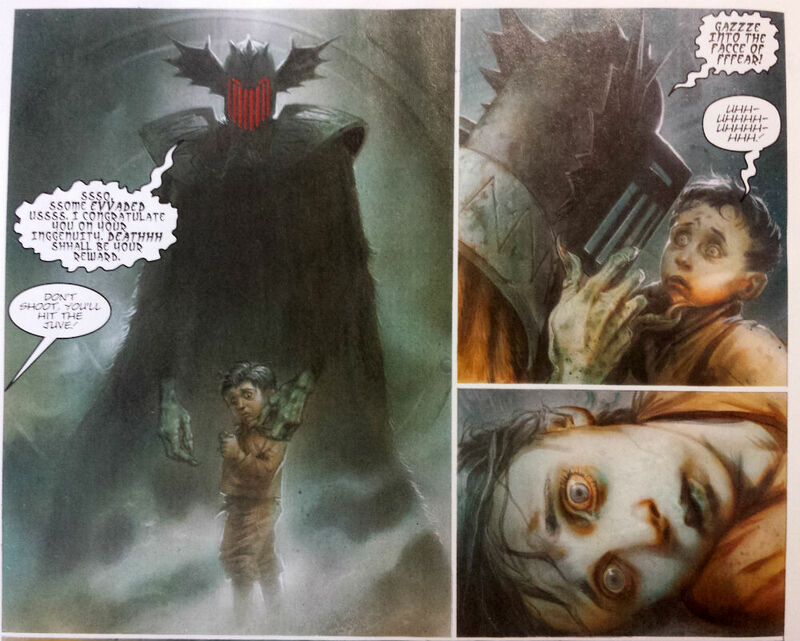 While all other Dark Judges play second fiddle to their leader Judge Death, Fear in particular never gets any respect. A lot of this stems from the very first time that Dredd confronted Fear, while the Dark Judges were bumping off numerous residents of Billy Carter block. 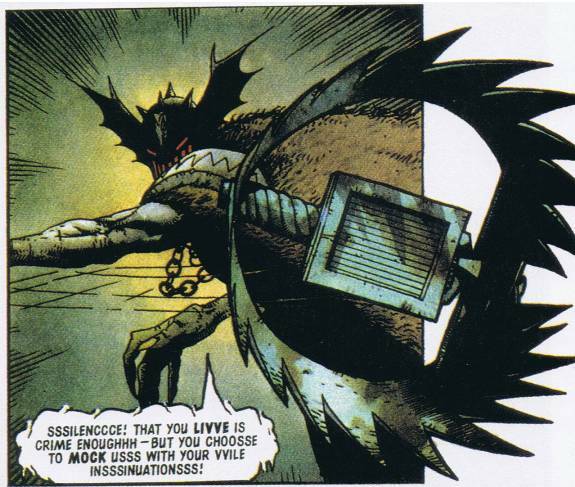 Fear tried using his creepy fizzog on Dredd, spouting “Gaze into the face of Fear!”. The rest is a little bit of comic book history, as shown below. That pattern has become something of a theme. 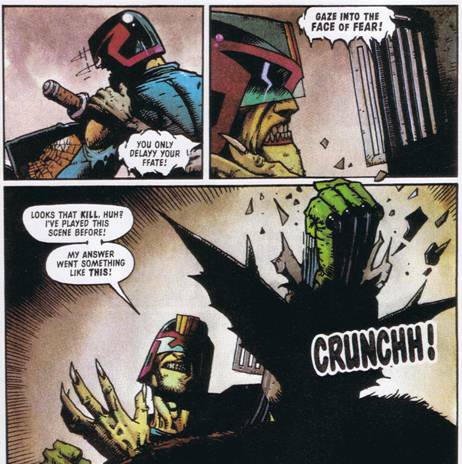 Judge Dredd + Judge Fear = Fears head gets mangled/severed/mashed. I never understood why in these cases Judge Fears helmet appears to have the durability of a damp Digestive biscuit, but who cares. Like most things in the Judge Dredd strip, the interpretations of the Dark Judges uniforms have varied and changed over the years. I picked the bits that I liked the most from the images that I had looked through and went with scheme shown. 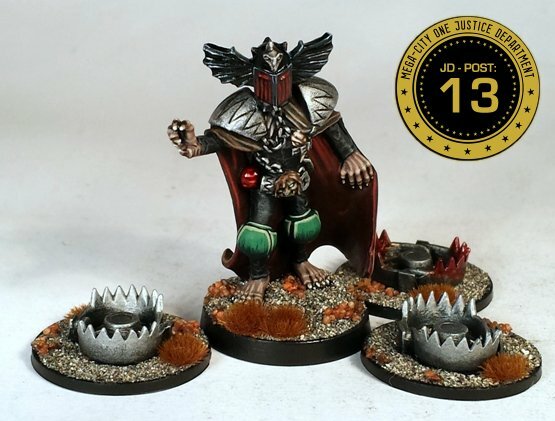 Although Foundry have manufactured models of Judges Death, Fire and Mortis for years, they have never sold a metal Judge Fear as far as I know. I was able to get my hands on this unreleased Foundry version of Judge Fear a couple of years ago though and to finally get it fully finished over the weekend just passed. As I painted the other Dark Judges a while ago now, it was a bit tricky trying to paint Fear in way that tied him in with them: I find that how I paint changes all the time, so I had to try to go back to previous form. Still, finally having a fully finished set of Foundry Dark Judges ready to photograph in front of my own tiny slice of Mega City One is a special kind of ssssatissssfaction. Seems you’ve faced you Fear. Sorry, I tried to resist. A little. Really nice work. His cloak and helmet in particular are excellent. The whole scheme is super tidy. I’m pretty jealous of your complete set. I had a good old chuckle at the digestive biscuit crack. Dark judges on the table next time, methinks. Yeah, Deadworlds thin, rotting line definitely needs to hit the table. I have an idea or three for how to get them on the table in a suitably scary and dangerous manner. They may have a comic side, but I would like each of them to be scary on the table too. Im too close to comment even vaguely objectively on the painting for now. I am delighted to be able to say that the four of them are good enough though. Thossse boyss are a real tick off the bucket lissst. Must be satisfying to finally get that monkey off your back. Nice painting, look forward to the next game! It is genuinely a relief to have them finished. Its amusing, but painting those guys was a draining experience… for the last four years… Obviously thats very appropriate for the subject matter, but seriously, they took it out of me. Oh and John, I hope that you get stuck into the Angels soon. I would have to upgrade my thrill-buffers if we got a multi player game featuring Dark Judges, Angel Gang plus Dredd & Anderson off the ground. Dredd rules, and the Dark Judges are the best of his enemies, IMHO. 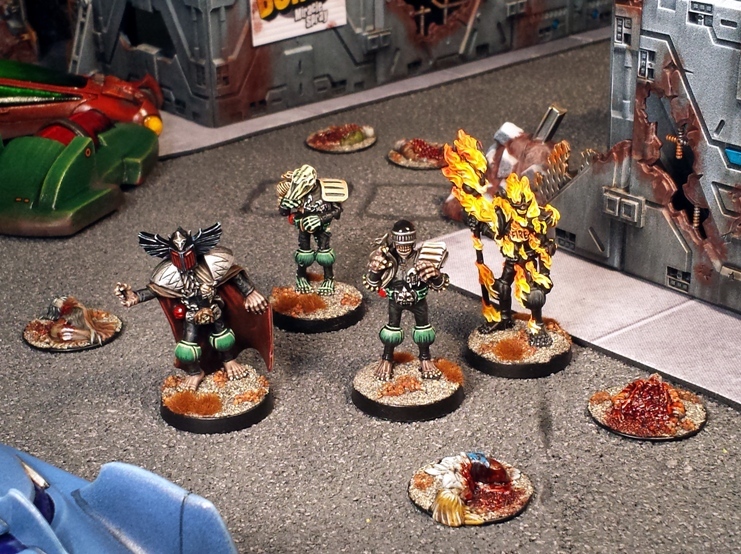 I’ve never seen these minis painted up as well as you’ve done, thanks for sharing and inspiring! Thanks Tiny Basement, very kind. His outfit maybe a bit preposterous but it looks like with a suitable art style in the comic books, he could be quite menacing. Of course the converse is, he could also be very goofy looking. I think your painting style on the miniature is a good combination of both. His unsavoury extremities and painful looking man traps don’t hurt that. Your comment made me feel that I was doing Fear a disservice, perhaps not treating him with some of the limited respect for his creepiness that he is due. I edited the post to include a couple of extra images, one of which really does show the character at his sinister best. Its interesting that you mention Fear being your favourite. As a young kid reading the comic, I liked Fear the most. Im not sure if it was because he was the underdog (as far as any Dark Judges are underdogs) or because I preferred his look to the one note Fire and the cow-skulled Mortis. My opinion on the characters changed at some point in my teens, favouring Mortis. Im not entirely sure why, but it did. Thanks fo rthe feedback Chico! Fear is clearly not my pick from the 4 (design/sculpt wise) but the painting would make him look like the boss for anyone who doesn’t know better. That was a mandatory group to have fo ryou Paul, the world’s a better place now. The model was never put into full production as far as I know. Apparently the head of the original sculpt was removed and rotated counter clockwise before moulding, presumably to keep the head wings in line with the body/cape to minimise risk of mould damage. That might have lessened the sense of purpose in the models pose perhaps. You are right about the Dark Judges being mandatory though. Ten year old Paul is absolutely thrilled that thirty-nine year old Paul finally got around to it. Thanks thesciencegeek, Im glad that you liked it. I think that always the best part Paul when they all come together as a group & you did a great job on keeping them looking like they where all painted around the same. 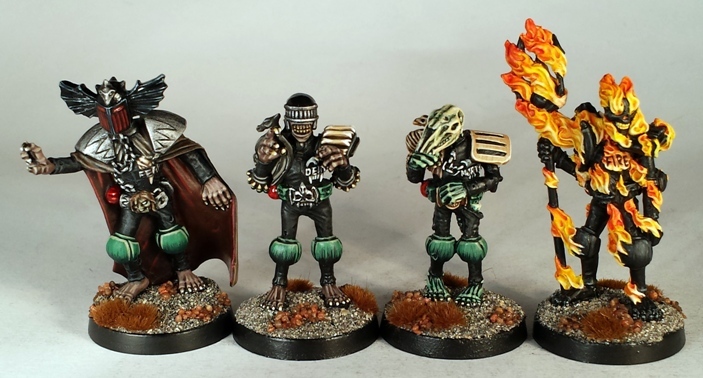 Nice collection dude – I never got into judge dread myself, but these four look spiffing to me 😀 Well done on collecting and painting the set, thanks for sharing! Thank you for the feedback Alex.